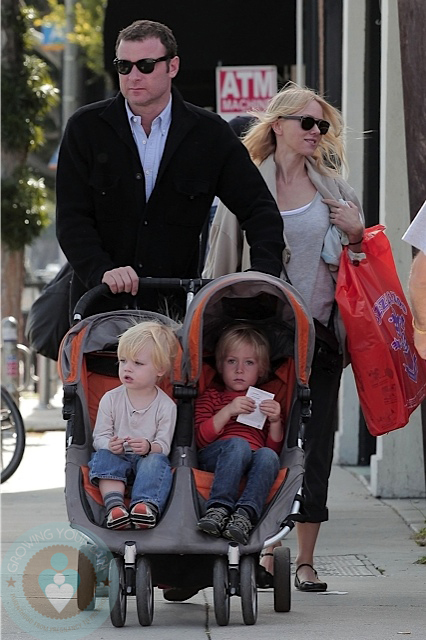 Naomi Watts and Liev Schreiber were photographed in LA spending a leisurely day with their boys, Sasha and Sammy. The family enjoyed breakfast together before heading out for a stroll. “Because now I’m a mom and I have to answer those questions,” Watts continued, referring to her husband and fellow actor Liev Schreiber and their two children. “And then of course, it has to be about the filmmaker and his vision,” the actress added. The busy mom has also said that her recent role in the drama Mother and Child was one of the favourites of her career because her character was so varied. Liev pushes the boys in a Baby Jogger City Mini double stroller.